The year 1986 was the breakthrough year for 22-year old Tom Cruise. He led the young pilots in Top Gun, the highest grossing movie of the year, and starred besides Oscar winner Paul Newman in The Color of Money. I was in the middle of primary school that year and I didn't watch Top Gun at that time, but I remember that some of my schoolmates drew Top Gun's logo in their notebooks. Yes, Top Gun had a huge impact on several generations on moviegoers. Why? Because it included a handsome and fearless lead character, who not only defeated enemies in the air, but also won a heart of a beautiful woman. He was dressed in jeans, wore a leather jacket and a pair of sunglasses. And he rode a motorcycle and flew a military fighter. Beat that! Let’s check product placement from Top Gun in more detail. There are several brands that were included in the movie (Kawasaki, Budweiser), but the most important are Ray-Ban’s Aviator sunglasses and US Navy (not exactly a brand, but let’s not complicate). In 1983 a sunglasses production company Ray-Ban struck a product placement deal with producers of Risky Business, the first major Cruise’s box-office hit. The agreement was very successful and resulted in a 50% increase in sales of the Wayfarer model. Three years later Ray-Ban and Tom Cruise cooperated again. This time he and his Navy colleagues wore Aviators. The result: the sales of Aviator sunglasses rose by 40 percent in the seven months following the release of the movie. It’s one of the classic examples of successful product placement. The Aviator model became famous in the mid 80’s, mainly because of the celebrity endorsements, e.g. Michael Jackson and Tom Cruise. Aviator model has survived time rather well and can be seen in the movies, TV shows and on several celebrities. For additional info on sunglasses in movies I suggest checking Sunglasses ID. After almost 25 years Top Gun is still over-the-top patriot movie, but at that time it was also something else. 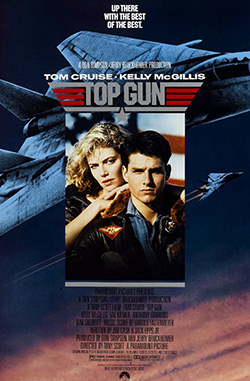 The movie’s producer, John Davis, stated that “Top Gun was a recruiting video for the Navy. It really helped their recruiting. People saw the movie and said, 'Wow! I want to be a pilot. '” Apparently they were successful. The US Navy set up recruiting booths in the major cinemas to try and catch some of the adrenaline charged guys leaving the screenings. They even stated that after the release of the movie the number of young men, who wanted to be Navy aviators, went up by 500 percent. Top Gun is not the greatest movie of all time; however it is an example of what can be done with clever use of product placement, especially if it’s unforced and put in the hands of young and upcoming star.